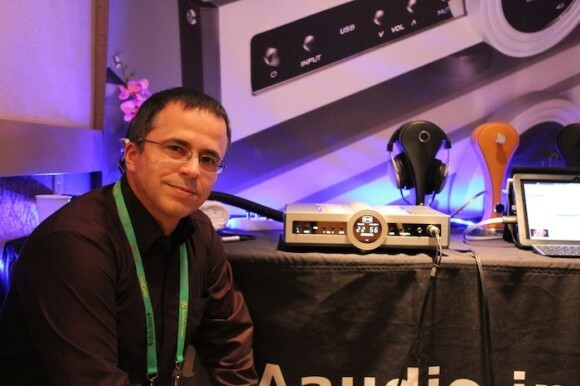 The sound of people trying to sell stuff; it’s often the biggest noise at hi-fi shows. Fair enough. Manufacturers and retailers have to make a living. That’s why they’re come to the Atrium and Hilton hotels in Irvine each June. Exhibitors spend their money in the hope of recouping their investment via future sales. Nothing new about that. What sets T.H.E. Newport Beach is the positivity and enthusiasm of many exhibitors. Said enthusiasm and collegiality transcends the sound of business being done. I guess that’s why attendees – and a tonne of press – return in greater numbers each year. I guess it’s also why this show has swiftly become as popular as RMAF but with a more Californian (read: laid back and breezy) vibe. I’ve previously (privately) argued that attending a demo should be more like spending time at a friend’s house. In my ideal world, the exhibitor serves drinks and food to make guests feel as comfortable as possible. Music choices are aimed more toward the guest tastes than the host’s. The latter requires creative risk-taking as well as a taste for the unusual. 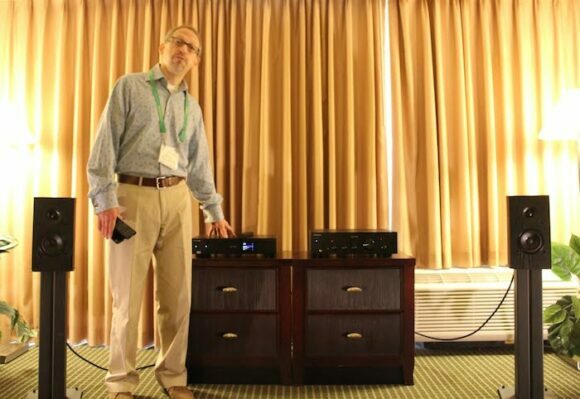 Patrick Tang of Glow Audio and Joel Scilley of Audiowood nail it. Even though they each have fine wares on show, drinks and nibbles are served up front in a bid to create a homely atmosphere. Tang’s new Amp Two is bigger and badder than the well-received, single-ended, DAC-packing Amp One. This new push-pull runs 15wpc for $1500. The internal USB DAC is no more but the Glow DAC 1.3 is currently a freebie with each Amp Two order. Even if you’re not a vinyl guy, I implore you to check out the various Audiowood turntable designs. They’re unique and beautiful and Scilley himself is as humble as they come. Even by the third day of a super-intense weekend Carlos Candeias owner of German manufacturer B.M.C. was wide-eyed and full of beans. He tells me the PureDAC features internal tech wizardry that has yet to make it to B.M.C.’s own high-end unit. I took ear-time with their relatively new PureDAC. As a headphone amplifier with a pair of Beyerdynamic T1 ‘phones. Candeias’ self-remastered version of Nick Cave & The Bad Seeds’ “Until The End Of The World” painted rich tonal colours in a wide open space across this listener’s mental landscape. Clarity and subtlety here were both standouts. The PureDAC doubles up as a digital pre-amplifier with analogue volume attenuation for the first 40db, then digital attenuation for the remainder. Candeias is determined that I/you don’t refer to it as a “budget” unit. It looks like a $5k unit, sounds like a $5k unit…and sells for $1600. Strewth. Checking out the behemoth that is Plinius’ SA-103 amplifier I was reminded of the futility of assessing individual components in the chain. One has to take each system as a single entity. A hi-fi gathering like this is really just a nerdy show ‘n’ tell for grown-ups. So no comment here on the merits of the two Plinius being run as monoblocks in the Eficion room. However, I can tell you that the SA-103 is a BIG beast and it looks stunning. (It looked so impressive that I forgot to take a photo – *slaps forehead*). The SA-103 runs in class A and class A/B (125 mighty fine watts per channel) and sells for a shade over $10k. Blimey. The exception to not assessing individual components is loudspeakers. The buzz about the Pioneer room got louder and louder as the weekend wore on. I swung by Sunday morning to find the hype completely justified. Designed by the brain of TAD – Andrew Jones – Pioneer’s SP-BS22 standmounts sell for US$129. $129! No BS here, folks. I learnt Best Buy doing them for $89. Say whaaaat? Even in the context of full sticker price, they sounded terrific. TEE-RIFFIC. Anyone looking at entry-level Wharfedale, Usher, PSB, Epos, etc. should check these out first. Buy a pair, if you don’t like them, give ‘em to your parents or a mate. Proof positive that no-one need suffer bad sound. I gave serious thought to a Best Buy visit on the way to the airport because the shipping to Australia would run me more than the speakers themselves. Bugger. More show and tell. With a new Australia distributor until their belt there’s been an upsurge in Channel Islands chatter. I know a few guys who really rate their D*200 Class D monoblocks (US$3500/pr). Sure enough, Dusty Vawter has them front and centre in his room. At the top end of the chain was the Transient MKII (US$699) with VDC*5 MKII power supply (US$329). I’d almost forgotten that the Transient MKII works as both USB-S/PDIF convertor and DAC – the latter feature only being added in the very last stages of development. There aren’t many of these two-fers doing the rounds and at less than $1k for the combo, it’s probably the nearest rival to Resonessence Labs’ superb Concero. Noice. Wyred4Sound’s EJ Sarmento pretty much demanded that I go check out Fritz Heiler’s LS 5/R standmounts. “OK then, I will!” was my retort – and I’m really glad I did. Scanspeak Illuminator drivers standout on the specifications sheet and you only need to spend a few minutes listening to know that the $3000 RRP buys you a heap of musical engagement. I suspect we’ll see these running with Wyred4Sound’s mINT at shows to come. Bonza. Part 2 of my coverage is here. Part 3 is here. 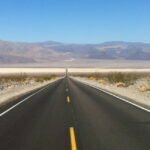 Some musings on DSD here. How does the Fritz LS 5/R compare to the KEF LS50 in the bass department and the overall impression between the two? Impossible to call with different rooms and musical programmes stirred into the evaluation mix. I know that might sound like a cop out but I heard them on different days and for 15 mins each, tops. The Fritz *might* be the more laid back of the two, but hard to tell with any certainty given difference in a) upstream electronics b) room and c) music choices. Thank you for taking your valuable time to answer my question John, I think I will make an audition to hear for myself. By the way do you know what kind of tweeter were being used on the Fritz LS 5/R didn’t see anything on his website. 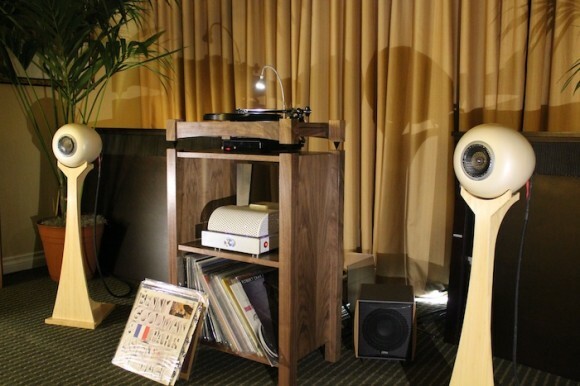 In this land of Make Believe that was the Newport Show, where $10,000 speakers and $20,000 amplifiers were the norm, the GLOW/Audiowood/CRL room offered up stylish and affordable gear for a new generation of audiophiles. It was satisfying to inform listeners that the great sound they were hearing came from speakers costing under $450 a pair, when just down the hall a vender was hawking his “affordable” loudspeakers costing $8,000 a pair, with a straight face. The response from many listeners was disbelief, even shock, as so many audiophiles have been led to believe that superior sound can only come from the priciest gear that only the 1% can afford. A big thanks to Joel Scilley, visionary designer extraordinaire at Audiowood, and Chip Winston of CRL, maker of quality cables and interconnects, for their collaboration with GLOW. As we prepare for events such as the T.H.E. 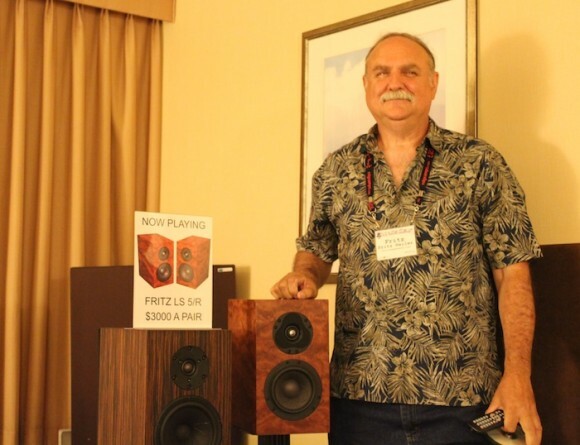 Show at Newport Beach or RMAF in Denver, we dealers and manufacturers/distributors alike are faced with some interesting decisions: Show a system that is very affordable and that speaks to today’s economy or show an all out assault of “high-end” gear without regard for budget constraints. 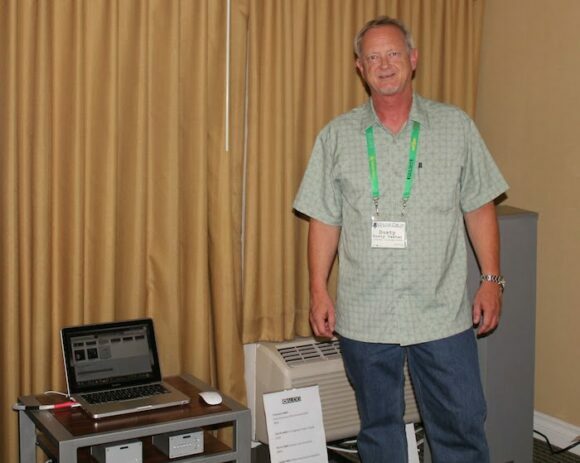 We’ve shown such systems as the former for the past several shows with very good results. This year we not only showed such a system but in a second room, we also showed some reference class electronics and speakers. Our thinking, as for many in the industry, was to make such a system available to those who would not otherwise have the opportunity to experience it. Some show-goers enjoy seeing and hearing what “high-end” has to offer and maybe don’t get to see some of the brands offered in their city. While others can appreciate such systems, they’d also like to hear what more “approachable” pricing can offer. It’s hard to cover everything for everyone. In our case (with actually 3 rooms) we made an effort to just have fun with everyone. I hope others were able to enjoy such a show in the same spirit of having fun.